The lunar eclipse on the 18th of October, 2013, heralds the beginning of a new eclipse cycle which will see us through until April 2014. As with other full moons, the earth comes between the Sun and the Moon, creating a polarity between subconscious feeling and conscious intent. 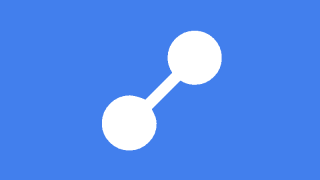 This disconnect can cause disorientation, or feelings of vulnerability and heightened sensitivity. This is felt stronger with lunar eclipses because the earth blocks the Suns life force from illuminating the Moon. There is a decidedly poisonous and dangerous feel about this lunar eclipse. This is because of some fixed stars and challenging aspects which I will mention below. Dramatic events are in store for us, especially with Uranus square Pluto hitting on November 1. Someone will enter the world stage to liven things up. This person will be seen as a Savior by some, and the Antichrist by others. At both the individual and the global level, we will have to show courage and faith, to deal with threats to our physical and spiritual health. There is a looming battle on both fronts. The October 2013 lunar eclipse is at 25 degrees Aries, lining up with the fixed star Kurda in constellation Cepheus. The Greeks called this constellation the King, but it really symbolizes the King Maker, the power behind the throne, or the Druid. Along with such heavy responsibility comes a stern face, aged by severe trials and burdens, worried by the repercussions of the judgments that duty demands. Kurda is exactly opposite the futuristic path leader star, Arcturus. This extremely fortunate star does come into play because it lines up with the Sun for this lunar eclipse. However Kurda is the main focus of the subconscious, mass-conscious Moon. Kurda is the opposite of Arcturus. Kurda is grey, ancient wisdom, standing stones, archeo astronomy, the past-life soul memory etched in the DNA of each cell in our body. Kurda is the spiritual leader, the adviser, calling on ancient knowledge which has been lost or discarded. “The ancient astronomers were Cepheans who made Cepheus the father of their royal family of stars.” . 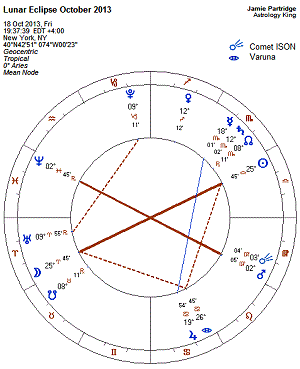 The dwarf planet Varuna is square the lunar eclipse as shown in the horoscope below. This presents us with a big challenge to remain “strong and competent without force or violence.” . Eric Francis calls Varuna “the great equalizer… often depicted carrying a noose. One of Varuna’s themes, both astrological and mythological, is the punishment of liars and those who do not honor contracts.”” . The coming of a spiritual, religious or political leader shown by the lunar eclipse in constellation Kurda, is supported by the mundane astrological interpretation of Varuna by Philip Sedgwick: “appointments or elected positions, delegation of authority, promotions, demotions, court martial, public humiliation.” . The previous solar eclipse focused on our physical health. The previous lunar eclipse focused on our mental and spiritual health. Now we are ready for the physical, mental and spiritual pressure applied by Mars opposite Neptune: spiritual warfare. 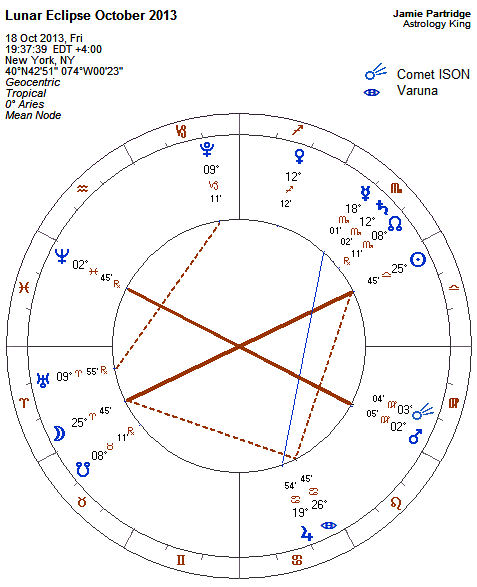 The chart for the October 2013 lunar eclipse shows Mars conjunct Comet ISON, also on the fixed star Phecda. The horoscope for comet ISON suggests contamination by poison. This is supported by the experts: “The shower is going to hit our planet from two directions at once… In my experience, this kind of double whammy is unprecedented.” . Latest reports say comet ISON will be visible by the end of October. The idea of Cephean leader coming to power during this eclipse cycle is also supported by the arrival of comet ISON, “Comets were also seen as heralding the rise to power of an ‘agent’, a military or religious leader, or a reformer.” . The four royal stars of ancient Persian are also called the Archangel stars, known to Christians as the four horsemen of the Apocalypse. Three of these bright and intense fixed stars are activated in the lunar eclipse horoscope above. “And I looked, and behold a pale horse: and his name that sat on him was Death, and Hell followed with him. And power was given unto them over the fourth part of the earth, to kill with sword, and with hunger, and with death, and with the beasts of the earth.” Revelation 6:8, King James Bible. 1. Stars, Stones and Scholars, Andis Kaulins, p.63. 2. List of Named Centaurs, Zsuzsanna Griga. 5. Comet ISON Meteor Shower, NASA. 6. Unexpected Visitors, Jonathan Flanery. Abso-frickin-LUTELY! I am seeing people “out for blood” today – the uncovering of lies and deceit seems to be the major trigger. More than a few are on the warpath today…. Other interesting note with Mars in Virgo opposite Neptune: seems the (small) critters are particularly sensitive to the vibe of this eclipse. My own pet has been unusually irritable today for no good reason. The mention of comet ISON and contamination by poison reminded me about an article I read just the other day in Discover magazine (October 2013) about widespread arsenic contamination of rice worldwide. Apparently, rice is a sponge for soaking up the inorganic (man-made) form of arsenic, which we all know is quite toxic. Brown rice, especially, harbors particularly high amounts of the stuff due to the outer layers harboring more of the poison. Do you know how many processed foods are made with rice, rice starches, or brown rice syrup? Let alone that rice itself is a major staple in Asian and Spanish cuisines….! And don’t think eating organic is going to help you here, either – organic products, such as those sweetened with brown rice syrup, tested highest in arsenic content. :-/ This is a HUGE problem! I’m in London at the moment and saw the same thing watching the news last night. Different stories but along the same themes. Two more pedophiles outed in court from the entertainment industry. More news about outing immigrants etc. Than ks for the info on the arsenic, didn’t know about that. I’m also concerned about the radioactivity from Fukushima entering the food chain in the ocean. FYI, Jamie – There have been widespread reports here of ALL Bluefin Tuna being caught on the Pacific Coast of the USA testing positive for radiation from Fukushima! Don’t know if it’s being reported on “Down Under” at all, and they’re certainly trying to minimize this by insisting the radiation is still at “safe” levels, although they can’t physically test *every* fish sold at market. I certainly don’t think I would be eating seafood if I lived on the West Coast. :-/ And the plant is STILL leaking, years later! Our collective governments are not doing nearly enough to address this, IMO, and you are very right to be concerned about this variety of contamination! *sigh* We fund NSA and determine the work it does is “of vital importance”, spending money spying on private citizens to “keep us safe”, while growing and importing foods en masse that give us cancer? Where is the budget for protecting & preserving our food supply, huh? Jupiter in Cancer + Ceres in Virgo want to know! Because if you ask me what I’d rather be spending money on, it’s definitely ensuring we don’t permanently contaminate our food supply – don’t even get me started on the GMO’s and the Monsanto Protection Act….! What is the natal chart for NSW? I am interested in seeing what shows for the fires currently burning there. Ed Tamplin is using the First Settlement horoscope which he put a lot of research into: January 26 1788, 5.23 am. Although my Sun is at 25 Libra (Arcturus), your description of Kurda, 25 Aries, describes me in many ways as well. I’m into ancient philosophy, standing stones, etc. Thanks for the feedback Greg. Sometimes I have difficulty working out the difference. I have Mercury and Venus on Arcturus, Saturn on Kurda. Just re read this one again due to your Feb full moon report, interesting that our Jesuit Prime MInister Abbot entered the global stage with election almost bang on and yes he was elected by majority at the time as some sort of saviour, many who I know voted for him are however are rethinking their voting choice as he begins to look less like a saviour and more like the anti christ, doo doo doo doooooo lol!